On Christmas Eve, a young girl dreams her beloved toy comes to life. He becomes her Nutcracker Prince and dances his Clara through the land of sweets and defeats the wicked Mouse King. Perhaps you've seen the ballet - it's so popular that many ballet schools make it their featured holiday production year after year. The music is amazing - from the wild Russian dance to the slow and mysterious Arabian dance. It all flows together to create a magical night of exhilarating performances. And yet, there is more to The Nutcracker than Peter Tchaikovsky's beautiful ballet. The story was taken from E.T.A. Hoffman's book, The Nutcracker and the Mouse King (Nussknacker und Mausekonig). Hoffman was a German of brilliant imagination, whose fantastic stories and operas are an important part of European literature. His original book is fascinating and gives many more details about the plot, such as why the Nutcracker and the Mouse King were enemies. Were the nutcrackers so popular in Hoffman's 19th-century Germany? Indeed, they were, and not only with children. The traditional nutcracker can be a homely, almost scary carving. His gnashing teeth cracked open nuts so greedily that woodcarvers would have fun by making them in the image of whoever was seen as the big, bad boss of the time. Sometimes he'd be carved as a politician and sometimes as a soldier. Leaders such as Napoleon were turned into Nutcrackers. 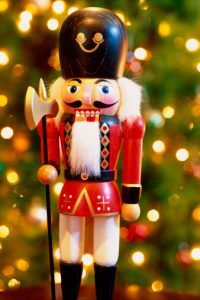 Today, nutcrackers come in all forms, from the traditional soldier to legendary kings to the Wicked Witch of the West! Did you know the nutcracker has a cousin? The smoker or rauchermen, was and is used to burn incense to bless the house and keep away the evil spirits during the longest night of the year in Germany. The Nutcracker ballet has been performed in America for more than 60 years, and we've come to think of it as part of an old-fashioned Christmas. The Nutcracker's music is perfect for holiday parties or just practicing for dance class, and we have lots of it to check out. If you can't see a local production or just want to see it again and again, the library has The Nutcracker on video. On November 2, Walt Disney Studios released the movie The Nutcracker and the Four Realms, a visually appealing retelling of The Nutcracker and the Mouse King and the orginal ballet. The film stars Keira Knightley, Mackenzie Foy, Matthew Macfadyen, ballet dancer Misty Copeland, Helen Mirren, and Morgan Freeman. Want to spend more time in The Nutcracker's world? Check out our Nutcracker Stories, Treats, and Crafts resource list for all that, plus music and performances you can watch at home.